Many of the powerful emperors of China’s last dynasties—the Ming (1368–1644) and Qing (1644–1912)—were patrons, collectors, and casual practitioners of the arts. They used art to legitimize and glorify their rule. It served many functions: for state rituals, for expressing piety, to dazzle palace visitors, to build diplomatic relations, and for personal pleasure. The emperors’ officials oversaw the palace painting academy, imperial porcelain factory, and numerous other workshops. Their artists creatively reworked earlier traditions, which bolstered the emperors’ legitimacy by showing their command of China’s long history. Many emperors supported international trade with Japan and Korea, Southeast Asia, the Himalayas, and the Indian subcontinent as well as the Islamic world and Europe. 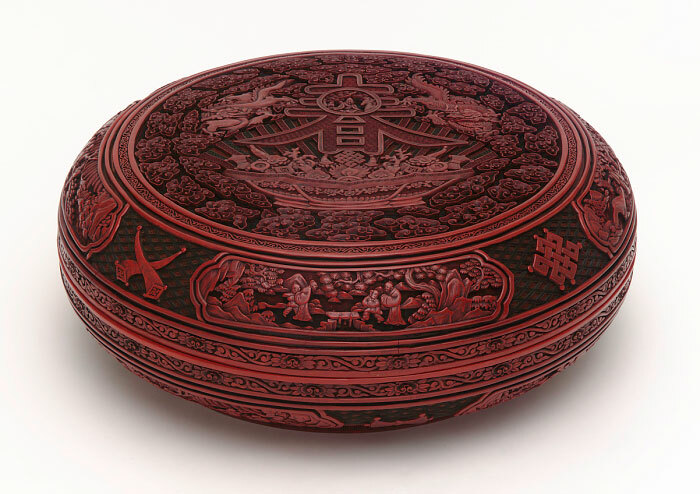 These exchanges helped shape the development of Chinese art, especially in the early fifteenth-century and eighteenth-century courts emphasized in this gallery. While the Ming and Qing courts followed many of the same practices in government and art, the Ming emperors were native Chinese, and the Qing rulers were not. Heirs of Manchu chieftains who swept into China on horseback from the north, the Qing emperors embraced all things Chinese, but also steadfastly maintained their own traditions.